Bali and Pontianak are two Indonesian cities which open gates to foreign tourists, conventions and business. Being more than just a holiday spot, the island offers a cultural destination, presenting the local’s unique and exotic tradition. On the other hand, Pontianak is the door to neighboring Malaysia and Brunei Darussalam. Bali, known as the island of a thousand temples, is always crowded with domestic and international tourist. 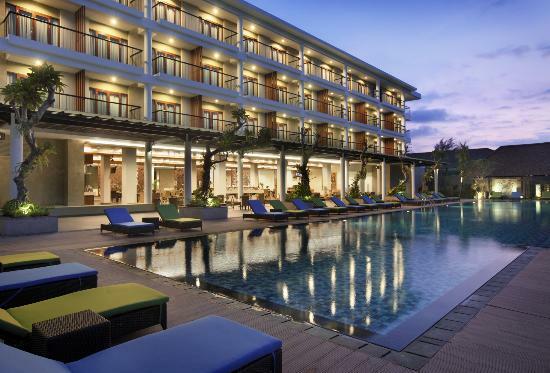 Hotel Santika Siligita – Nusa Dua Bali and Hotel Santika Kuta are three-star hotels ready to offer guests an enjoyable stay during their stop on the island. The two Santika hotels are both located in strategic places to fulfill your accommodation needs. Siligita is the quiet Southern side of Bali while Kuta is famous for being the heart of all the excitement. Located at Jl. Pintas Siligita no 3A, Banjar Peminge, Hotel Santika Siligita – Nusa Dua, is in the center of the island’s convention destination. The hotel ‘s 153 rooms, divided into superior, deluxe and suites, feature safe deposit box, tea/coffee maker, LCD TV and Wi-Fi internet access. With modern minimalist design and classy style, the rooms are decorated with elegant Balinese painting for a local touch. For both business and pleasure, the hotel has lobby lounge, Mengiat Cafe, Santika meeting room which accommodates up to 200 people, fitness center, spa and swimming pool. On the other side, Hotel Santika Kuta is located at Jl. Raya Kuta No. 98. The hotel has 101 rooms and suites, meeting rooms, coffee shop and swimming pool. Its strategic location makes it easy for the guests to visit popular tourist attractions. 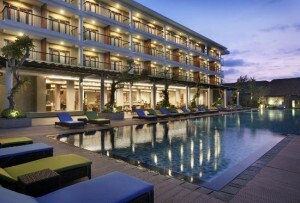 Unlike the two Santika hotels in Bali, Hotel Santika Pontianak at Jl. Dipenogoro No. 46 is located in the heart of the city and a few minutes away from the airport. It is the ideal place to stay when you are going to explore West Kalimantan province and the land of equator. Aside from having 129 rooms, the hotel also has a ballroom which can accommodate up to 600 people. The three-star Santika hotels are available in 14 big cities in Indonesia, including Bandung, Bali (Kuta and Siligita – Nusa Dua), Bangka, Bengkulu, Bogor, Serpong (BSD City), Cirebon, Makassar, Lombok (Mataram), Jakarta (TMII), Pontianak, Surabaya (Pandegiling and Jemursari), Tasikmalaya and Palu. With sincere service and “Indonesian Home” as Santika values, as seen on the application of Indonesian heartfelt hospitality, family values, local tradition, natural touch, and freshly clean facilities, Santika hotel is an Indonesian accommodation with international quality.